It is no secret that we love mismatched bridesmaid dresses. Whether they are in shades of pastels or punchy pinks, the look is positively stylish. Taking this concept and applying to the groomsman, and still keeping a cohesive look for the entire wedding party can easily be done. 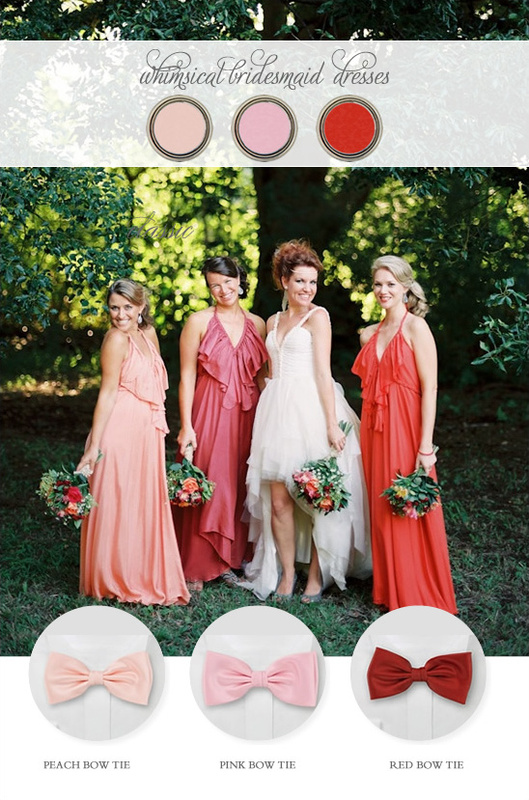 To give you a few examples we rounded up an assortment of mismatched bridesmaid dresses and paired them with accessories from bows-n-ties.com. 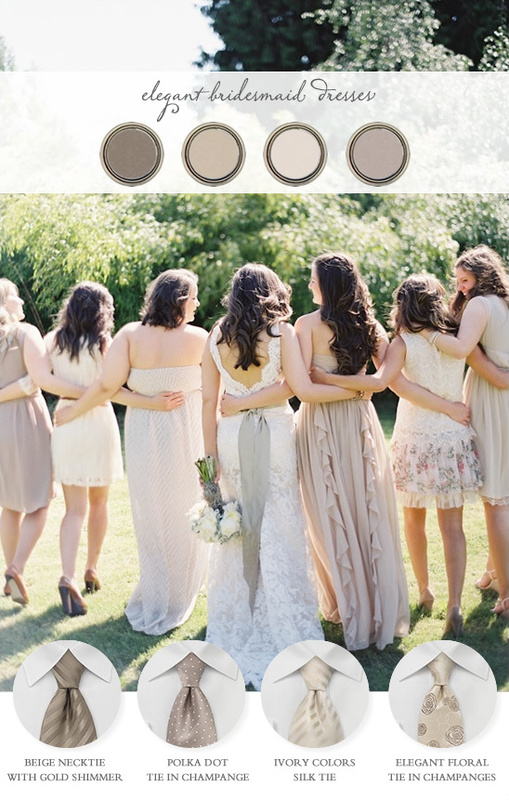 First off, we have a classic wedding with bridesmaid dresses in shades of pastels. To maintain a polished look select ties with the same plain fabric. 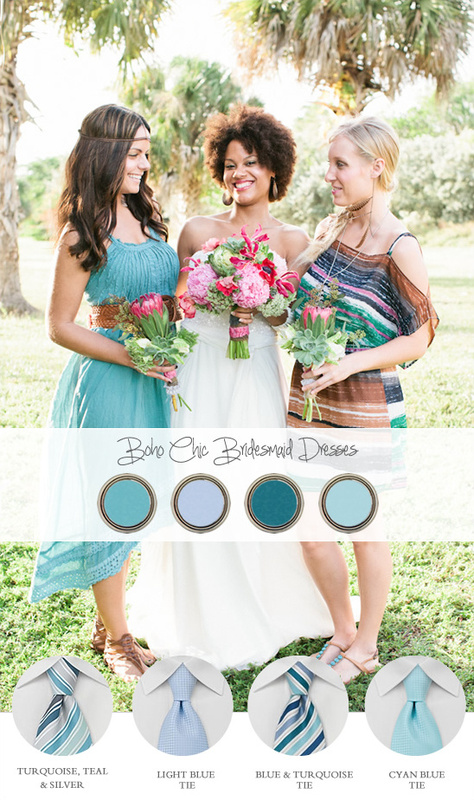 Take the colors of the bridesmaid dresses and coordinate the ties. We went with a solid necktie in champagne cream, smoke gray, pink and light blue. A light grey suit with a solid white shirt would look positively dashing with theses dresses. To see this entire wedding, and what the groomsman actually wore click here. Photographed by Lane Dittoe. Next, we have an elegant barnyard wedding photographed by Erich McVey Photography. The bridesmaid dresses were not only mismatched but each had a unique style, fabric and cut. Hues of Champagne, ivory, and cream tied these bridesmaids dresses together. For the groomsman, we selected ties that had different fabrics and patterns in the same cream color family. Bows-n-ties.com has a fabulous selection of ties in Champagne, ivory, and cream. You can see the entire selection by clicking here. Since lighter shades contrast nicely with darker hues, Tommy Hilfiger's suit in Rum Brown would look marvelous with these dresses. The bridesmaids above wore flowy dresses in an array of peaches and pinks at a carnival wedding from Feather + Stone . We think any wedding with a whole lot of whimsey deserves to have groomsman in fun and fabulous bow ties. Dress them in casual pants and shirts with suspenders for an upbeat look. An example of this on-trend look can be seen here. If you missed this over the top carnival wedding, check it out by clicking here. Below, this Bohemian Food Truck Wedding had bridesmaids in completely different dresses, but both looks have a boho chic vibe to them. Pair the groomsman in dark blue jeans, crisp white shirts and mismatched ties. We choose ties in the similar patters with different colors for a funky twist. We went with a light blue tie, light turquoise tie, turquoise, teal, and silver tie and this blue and turquoise tie from bows-n-ties.com. To see the groomsman in similar looks check out this eclectic inspirational shoot by Chelsey Boatwright Photography. If any of your mismatched bridesmaid dresses are from J.Crew, Alfred Angelo, or David's Bridal - be sure to check out bows-n-ties.com coordinating section. You simply click a swatch and it shows you coordination bow ties. They even have ties for difficult to match hue like J.Crew's Vintage Peacock. Don't forget to save 20% off to all WC readers by using the coupon WC20.